First off was the Revel Performa3 F208Be. The original F208, which is a standout speaker at $5000/pr., remains in the line, as do all of the other original Performa3 models. But the F208Be and stand-mounted M106Be are upgraded versions of their Performa3 counterparts, with all new drivers and crossovers. Speaking at various times with Mark Glazer, principal engineer at Revel; Kevin Voecks, acoustic technologies manager at Harman Luxury Audio Group; and Tim Gladwin, senior manager of Acoustics Engineering at Harman International, I got the sense that a lot of topflight engineering went into the new Performa3 Be models. And at a projected cost of just under $10,000 a pair for the F208Be, they slot in nicely between the original Performa3 series and Revel’s more expensive top-of-the-line Ultima2 series. So what makes a speaker worth $10,000 a pair in my mind? Well, a totally relaxed and grainless midrange and smooth, sparkling highs, which the F208Be exhibited in my very enjoyable, but all too short, time with them. This must have a lot to do with the more robust motor structures of all of the drivers, the beryllium-domed tweeter that was inspired by the one used in the Ultima2 series, and all-new crossovers with premium components. The midrange and bass drivers also benefit from cones that feature Deep Ceramic Composite technology -- durable ceramic over aluminum, which is said to provide an ideal stiffness-to-weight ratio for a speaker cone. When I listened to the F208Be at the Harman display at the Hard Rock Hotel, the sound was spectacular, with a deep, wide soundstage; amazing transparency; and fast, tight bass, even in the small portable room that was constructed for the demo. Tens of thousands of dollars of Mark Levinson electronics were driving the speakers, and the setup also featured the new Levinson No. 515 turntable as a source, but I suspect that these speakers would sound excellent with any high-performance components. I also consider the GoldenEar Technology Triton One to be another of the benchmark loudspeakers in the $5000/pr. 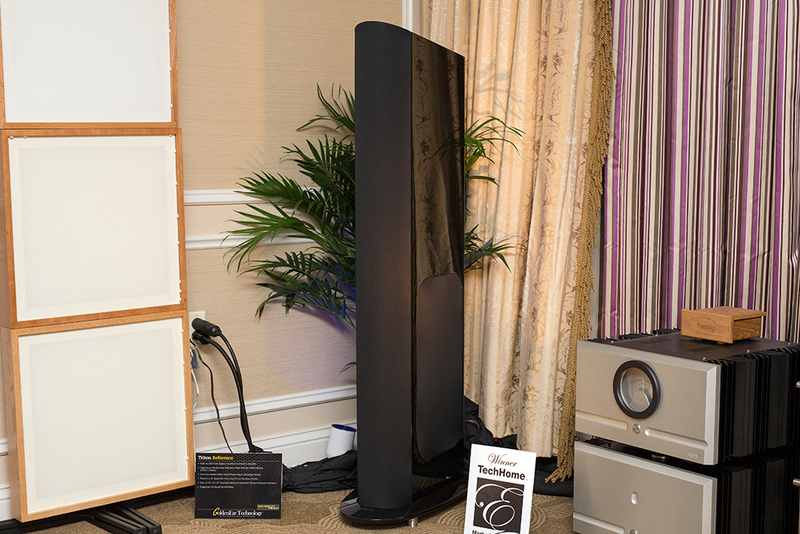 price range, but this year GoldenEar displayed its new Triton Reference, priced at $8448/pr. 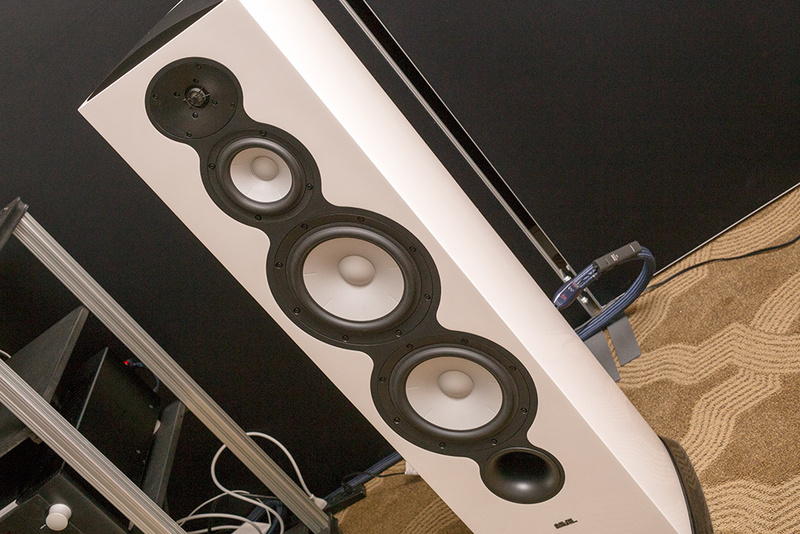 Although it features a similar driver configuration to the Triton One, the Triton Reference is a slightly larger speaker. And like with Revel, this new GoldenEar features totally redesigned drivers, which have been blended together with a fully balanced crossover. The bass amplifier and DSP circuitry are also said to be improved over what’s used in the Triton One. Speaking with Bob Johnston, GoldenEar’s director of engineering, I learned that the drivers have all been substantiallyimproved and can play much louder than any the company made before. However, the real benefit is that when they play at similar levels as the company’s other drivers, there is said to be less distortion and compression. This was apparent during the demo, where both orchestral and jazz music were played at relatively moderate levels, but with an utter sense of ease and natural flow to the music. When horns were played, there was plenty of bite, but in a natural way and never irritating -- and the volume didn’t have to be turned way up for me to sense the immediacy of the sound. Kodo drums sounded like Kodo drums without anyone having to turn the volume to 11 and overload the room with enough bass to cause a concussion, even though I’m sure that a pair of Triton References are capable of this. This new Triton may have even more brawn than its very capable brethren, but it also possesses a rare level of refinement that I usually associate with much more expensive loudspeakers. The new Revel Performa3 F208Be and GoldenEar Triton Reference may set new benchmarks for performance in what I consider to be affordable high-end loudspeakers.